A third of people in the US and Europe will abandon phone lines in favour of wireless and broadband telephony come 2009, say analysts Gartner. Broadband telephony is gaining ground among consumers as people become more confident users of their high-speed net connections. 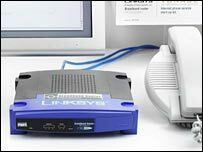 It offers a cheap alternative to fixed-line voice calls. By 2009, 70% of voice connections around the world will be wireless, the Gartner report found. This is due to falling mobile costs and greater penetration in countries such as China and India. Market research group Gartner predicted that handsets would be available for as little as £14 by 2010. Skype, which provides software for broadband telephony via the PC, has proved immensely popular with consumers, although Gartner predicts that VoIP-enabled telephones will eventually win out. "With Skype lots of people have downloaded it but not that many people use it. It requires a computer and a headset and it is more likely that telephone services such as that offered by Vonage will be what catches on," said David Neil, research vice president at Gartner. The growing popularity of broadband telephony is both good and bad for traditional telephone companies, the report said. Most are embracing the technology and will therefore gain some revenue from it but the fact that the prices for VoIP are much lower means it will not be a cash cow in the same way as fixed telephone services have been in the past. There will be three billion mobile subscribers in the world by 2010, according to Gartner. Mr Neil thinks it is vital that telcos put wireless at the top of their agenda if they are to be successful in the future. "They will have to have a very clear wireless strategy or they are going to be dead," he said. Many fixed line operators are integrating wireless with their traditional phone services, selling the service to consumers with the convenience of having one device and one bill for both mobile and fixed line calls. But if mobile voice pricing continues to fall this might not be enough to convince people that they still need a phone line in their home. It will also be crucial for telcos to upgrade their networks so they can provide the backbone to the much talked-about digital home of the future, where appliances such as ovens can be switched on remotely. In this, British Telecom, alongside firms such as South Korea Telecom, is one the leaders, according Mr Neil. Its rollout of the so-called 21st century network is well underway and will broadband telephony, TV as well as applications for the digital home.